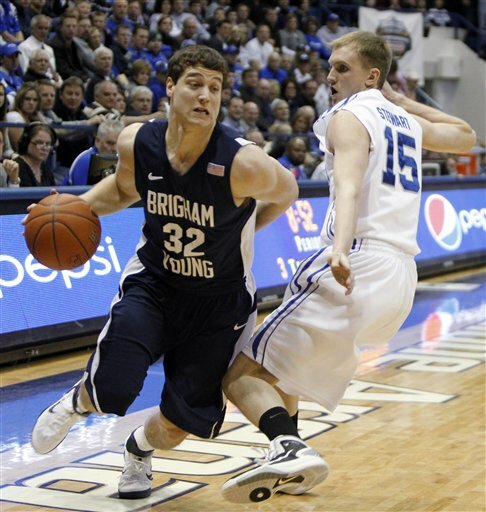 Seventh-ranked BYU and scoring machine Jimmer Fredette came to Clune Arena last night and put quite the jimmering on Air Force, running away with a 90-52 win. To their credit, the Falcons did manage to hold Fredette to 25 points — two less than his season average — and jimmering him into six turnovers. On the down side, three other Cougars scored in double figures as BYU shot the lights out and handed Air Force its worse home loss in program history. To add insult to injury, Air Force’s home arena was apparently loaded with BYU fans, and in the second half they essentially made the BYU boys feel like they were back home in Salt Lake City.